Keep the area beneath your Aspects tube feeder tidy with help from the Aspects Bigfoot Seed Tray for Quick-Clean Feeders. 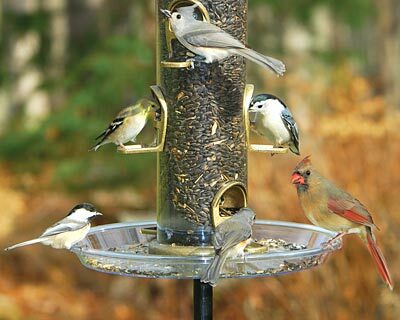 This sturdy, clear platform easily attaches to the base of your Aspects seed tube bird feeder (not included) with its spacer and threaded metal bushing. Using the spacer with this tray ensures that feeders with the Quick-Clean base are slightly elevated above the item, while the four small holes in the center of the platform allow you to release the base of the feeder with the item still attached. This aids in cleaning and reassembling the feeder with minimal effort. A lip at the edge of the tray keeps seed hulls contained, and drainage holes enable water to exit the item. Help your feeding station stay clean using this Bigfoot Seed Tray for Quick-Clean Feeders. Made in the USA. Lifetime guarantee. Note: This description refers only to the Aspects Bigfoot Seed Tray for Quick-Clean Feeders. The feeder shown is not included.